On Friday, December 16, the cast and crew of NBC-TV’s Chicago Fire spent the entire day in Westmont filming portions of an episode that will air on Tuesday, Feb. 14, 9 p.m., 2017. (Note-Originally scheduled for the previous Tuesday, Feb. 7.) The production crew shot scenes at the Fire-Police Facility at 500 N. Cass as well as the Chicago Prostate Center on Pasquinelli Drive. Look for more pictures and additional details from the shoot to be published after the episode airs. 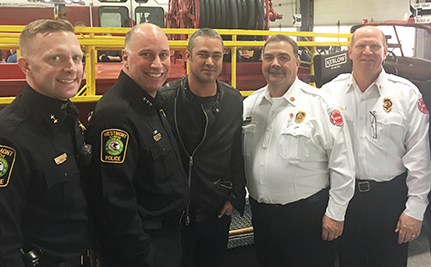 PHOTO - Police Deputy Chief Brian Gruen, Police Chief Jim Gunther, "Chicago Fire" Actor Taylor Kinney, Fire Chief David Weiss, and Fire Deputy Chief Steve Riley.